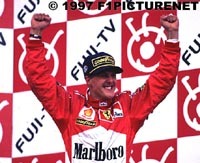 German Michael Schumacher won the 1997 Japanese Formula One Grand Prix today, thanks to his Ferrari team-mate, Eddie Irvine of Ireland, but no thanks to his old adversary, Damon Hill. Heinz-Harald Frentzen of Germany was second in his Williams-Renault, and Irvine third. Even before the race started, Schumacher's rival for this year's Drivers' Championship, Jacques Villeneuve, was disqualified from the race completely. During qualifying, Canadian Villeneuve was judged to have failed to slow his Williams-Renault at a danger point where yellow flags were being waved. A number of other drivers also failed to slow, and were given a variety of suspended sentences. However, Villeneuve was driving under a suspended sentence from a previous infraction of the rules, and so was immediately disqualified. The team appealed and, pending appeal, Villeneuve was permitted to start the race. What made the situation all the more volatile was that Suzuka has, over the years, been the site of some infamous accidents, which have then turned out to be anything but accidents. As it seems that Villeneuve's appeal will fail, it is very probable that he really would have liked Schumacher to fail to finish the race. On the grid, the two protagonists shared the front row. At the start, Villeneuve swerved across the track into Schumacher's path, trying to stop Schumacher overtaking. The manoeuvre was successful, and there was no crash as they went into the first corner, followed by the rest of the field. For the first couple of laps, Villeneuve led from Schumacher and Mika Hakkinen of Finland in a McLaren-Mercedes. But Irvine had other ideas, and going into a corner, overtook both Schumacher and Hakkinen in a bold move around the outside of the two other cars. He set off after Villeneuve, caught him and overtook him within a lap. While Villeneuve fell back to lead Schumacher, Irvine seemed to be rocket-powered. His lead grew and grew to around 12 seconds on the sixteenth lap, when he pitted. 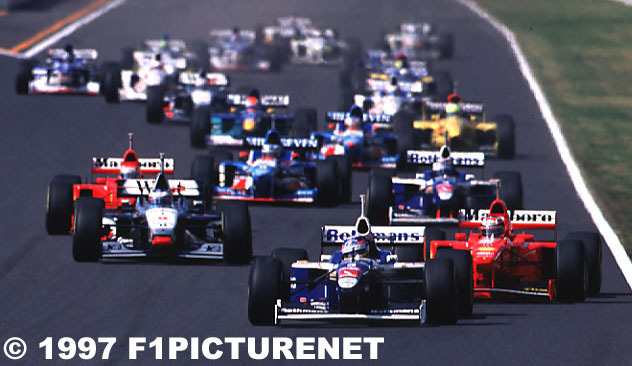 Villeneuve and Frentzen both led the race briefly, until their pit stops, when Irvine re-took the lead, followed by Schumacher and the two Williams' drivers. But Irvine was under clear orders from the Ferrari team and, within two laps, slowed drastically to allow Schumacher through, but then sped up enough to keep Villeneuve in third position. It was now Schumacher's turn to disappear, as Irvine played the team game and slowed Villeneuve's chase of Schumacher. It seemed that this might be the effective end of the race, but there were still a series of pit stops to come. Villeneuve tired of being kept behind Irvine and pitted on lap 30. In a mild disaster, the pit crew could not connect the re-fuelling nozzle correctly, and the car was stopped for 13.4 seconds. Villeneuve could now only hope that Schumacher's car would have a failure of some sort, or that he too would suffer a long pit stop. It wasn't to be. When Schumacher did pit some 4 laps later, he was stopped for only 9.1 seconds - one of the longer stops of the day, but more than enough to stay well ahead of Villeneuve. Meanwhile, Frentzen had worked his way up into second place ahead of Irvine, Hakkinen, Villeneuve, and the Benetton-Renault of Frenchman Jean Alesi. Now it really looked as though Schumacher had the race in his pocket. A big lead over Frentzen and only a few laps to go. No. Not quite. Call it irony, or poetic justice, but there was to be a little trouble ahead for Schumacher. With less than half-a-dozen laps to go, he came up to lap Hill, who was languishing well down the field in his Arrows-Yamaha. For whatever reason, Hill didn't let Schumacher through as easily as perhaps he should have. Perhaps Hill was remembering old battles with Schumacher. Perhaps Hill was, subconsciously, indulging in a little pay-back for the help that Schumacher had got earlier in the race. Perhaps Hill just thought he was good enough and fast enough to stay ahead of Schumacher. 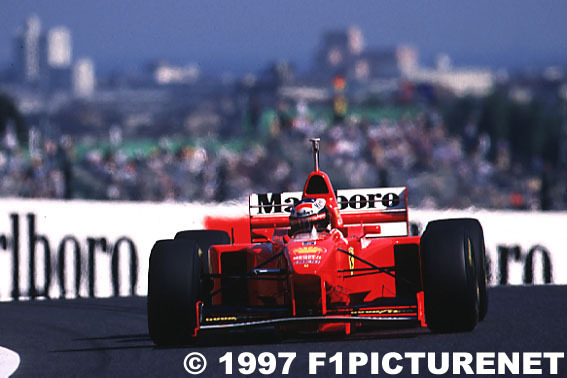 Whatever the reason, when Schumacher came up to Hill, he had a lead over Frentzen of more than 5 seconds. By the time Schumacher had fought his way past Hill and Frentzen got past Hill in his turn - though almost immediately - the lead was down to 1.1 seconds. Close ... but not enough. That basically was the gap when Schumacher and Frentzen crossed the finish line just a few laps later. Irvine finished third, with Hakkinen fourth, Villeneuve fifth under appeal, and Alesi sixth. Should Villeneuve's appeal fail, there will be two consequences. First, he will lose the two points he just won here. That will mean that he is one point behind Schumacher in the Championship. Second, it will mean that Alesi will move up one position, and Johnny Herbert of Britain, in a Sauber-Petronas, will move up to sixth. What will not be affected is the 1997 Constructors' Championship. Frentzen's six points were enough to ensure that Williams regain that title for a record ninth time. The F1 circus now moves back to Europe for the final, deciding race of the season at the European GP, to be held at Spain's Jerez circuit in two weeks on 26 October.